Surfactants are amphipathic molecules that consist of a non-polar hydrophobic portion usually a straight or branched hydrocarbon or fluorocarbon chain containing 8-18 carbon atoms, which is attached to a hydrophilic portion. The hydrophilic portion can be nonionic, ionic or zwitterion. Surfactants are low to moderate molecular weight compounds which contain one hydrophobic part, which is readily soluble in oil but sparingly soluble or insoluble in water, and one hydrophilic (or polar) part, which is sparingly soluble or insoluble in oil but readily soluble in water. Surfactants are classified according to the nature of their polar head groups  i.e. Carboxylates: Alkyl carboxylates-fatty acid salts (''soaps''); carboxylate fluoro surfactants. Sulfates: Alkyl sulfates (RCOO) (e.g.,sodium lauryl sulfate); alkyl ether sulfates (e.g.,sodium laureth sulfate). Sulfonates: Docusates (e.g.,dioctyl sodium sulfosuccinate); alkyl benzene sulfonates. Surfactants that do not ionize in aqueous solution, because their hydrophilic group is of a non-dissociable type, such as alcohol, phenol, ether, ester, or amide [Figure 1]. A large proportion of these nonionic surfactants are made hydrophilic by the presence of a polyethylene glycol chain, obtained by the polycondensation of ethylene oxide. Non ionic surfactants, i.e., surfactants with an uncharged polar head group, are probably the ones used most frequently in drug delivery applications. The critical micellization concentration for such surfactants is generally much lower than that of the corresponding charged surfactants, and partly due to this, such surfactants are generally less irritant and better tolerated than the anionic and cationic surfactants, e.g., polyoxyethylenes, poloxamer (188,407,338,184), poloxamine (304,904,908), polysorbates. 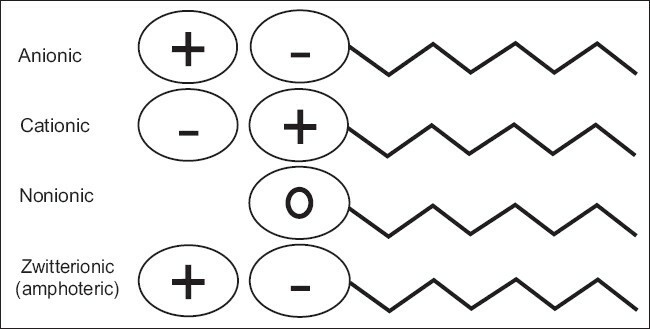 Cationic surfactants are dissociated in water into an amphiphilic cation and an anion, most often of the halogen type [Figure 1]. A very large proportion of this class corresponds to nitrogen compounds such as fatty amine salts and quaternary ammoniums, with one or several long chain of the alkyl type, often coming from natural fatty acids. Zwitterionic surfactants are less common than anionic, cationic and non ionic ones. When a single surfactant molecule exhibits both anionic and cationic dissociations it is called amphoteric or zwitterionic. The polar head group consists of a quaternary amine group and a sulfonic or carboxyl group [Figure 1]. This is the case of synthetic products like betaines or sulfobetaines and natural substances such as aminoacids and phospholipids (phosphatidylcholine, sphosphatidylethanolamine). Anionic materials tend to permeate relatively poorly through stratum corneum upon short-time exposure but permeation increases with application time. The alkyl sulfates can penetrate and destroy the integrity of the stratum corneum within hours of application. Anionic surfactants cause greater enhancement and damage than non ionic surfactants. Anionic has been found to increase deuterated water permeability of human epidermis in vitro. The surfactants such as sodium lauryl sulfate, after extended treatment, irreversibly caused protein denaturation, membrane expansion, hole formation, and the loss of water -binding capacity. [Table 1] depicts the use of various anionic surfactants as enhancers in transdermal drug delivery. Molecules show main action on keratin fibrils of the cornified cells and result in a disrupted cell/ lipid matrix. Cationic surfactants interact with skin proteins via polar interactions and hydrophobic binding. Hydrophobic interaction between surfactant chains and the protein result in pendant ionic head groups and subsequently swelling of the stratum corneum. Cationic molecules are more destructive to skin tissues causing a greater increase in flux than anionic surfactants. [Table 2] illustrates the role of cationic surfactants as penetration enhancers. Nonionic surfactants, which are a safe class of enhancers, also offer a means of enhancing drug permeation through the skin. Nokhodchi et.al. reported two -possible mechanisms by which the rate of transport is enhanced using nonionic surfactants. Firstly the surfactant may penetrate into the intercellular regions of stratum corneum, increase fluidity and eventually solubilize and extract lipid components. The effect of nonionic surfactant on the rate of the permeation of drug compound through membranes from a formulation is highly dependent on the physical state of surfactant and its concentration in the locality of the membrane. [Table 3] presents the mostly used nonionic surfactants in TDDS as penetration enhancers. The effect of surfactants on the enhancement of drug permeation through skin has been well reviewed. Research in this area has proved the usefulness of surfactants as chemical penetration enhancer in the transdermal drug delivery. In many instances they have been found to be more effective than other enhancers. Focus should be on skin irritation and toxicity with a view to select from a wide range of surfactants. 1. Kumar R, Philip A. Modified Transdermal Technologies: Breaking the barriers of drug permeation via the skin. Tropical J Pharm Res. 2007; 6:633-44. 2. Williams AC, Barry BW. Penetration enhancers. Adv Drug Del Rev. 2004;56:603-18. 3. Barry BW. Mode of action of penetration enhancers in human skin. J Control Release 1987;6:85-97. 4. Piret J, Désormeaux A, Cormier H, Lamontagne J, Gourde P, Juhász J, et al. Sodium lauryl sulfate increases the efficacy of a topical formulation of foscarnet against herpes simplex virus type 1 cutaneous lesions in mice. Antimicrob Agents Chemother.2000; 44:2263-70. 5. Tadros TF. Applied surfactants: Principles and applications. KGaA:Weinheim: Wiley-VcH Verlag GmbH & Co. 2005.p.437. 6. Malmsten M. Surfactants and Polymers in drug delivery. Sweden: Marcel dekker; 2002. 7. Smith EW, Maibach HI. Percutaneous penetration enhancer. 2 nd ed. Boca Raton:Taylor and Francis;2005. 8. Somasundaran P, Hubbard A. Encyclopedia of Surface and Colloid Science. Pezron I. 2 nd ed. New York: Taylor and Francis; 2006. 9. Allen LV, Popovich NG, Ansel HC. Pharmaceutical dosage forms and drug delivery systems. 8 th ed. Baltimore:Lippincott Williams & Wilkins; 2005. 10. Barel AO, Paye M, Maibach HI. Handbook of cosmetic science and technology. 3 rd ed. New York:Marcel Dekker; 2009. 11. Ananthapadmanabhan KP, Yu KK, Meyers CL, Aronson MP. Binding of surfactants to Stratum Corneum. J Soc Cosmet Chem 1996;47:185-200. 12. Rhein LD, Robbins CR, Fernee K, Cantore R. Surfactant structure effects on swelling of isolated human stratum corneum. J Soc Cosmet Chem 1986; 37:125-39. 13. Gloxhuber C, Kunstler K. Anionic surfactants: Biochemistry, toxicology, dermatology. Surfactant science series. 2 nd ed. New York:Marcel Dekker;1992. 14. Fulmer AW, Kramer GJ. Stratum corneum lipid abnormalities in surfactant induced dry scaly skin. J Invest Dermatol 1986; 86:598-02. 15. Jantharaprapap R, Stagni G. Effects of penetration enhancers on in vitro permeability of meloxicam gels. Int J Pharm 2007;343:26-33. 16. Patil S, Singh P, Maibach H. Radial spread of sodium lauryl sulfate after topical application. Pharm Res 1995;12:2018-23. 17. Huang CM, Wang CC, Kawai M, Barnes S, Elmets CA. Surfactant sodium lauryl sulfate enhance skin vaccination. http://www.mcponline.org/content/5/3/523.full. (Accessed November 28, 2005). 18. Walters KA, Bialik W, Brain KR. 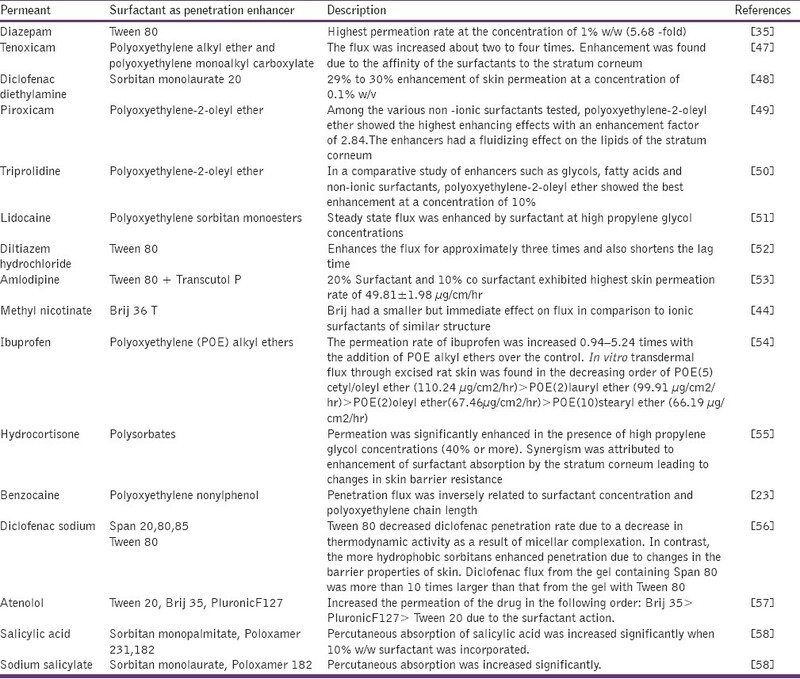 The effects of surfactants on penetration across the skin. Int J Cosmet Sci 1993;15:260-70. 19. Walters KA, Walker M, Olejnik O. Non-ionic surfactant effects on hairless mouse skin permeability characteristics. J Pharm Pharmacol 1988;40:525-29. 20. Kitagawa S, Kasamaki M, Hiyama F. Effects of double-chained cationic surfactants n-dimethyldialkylammoniums on skin permeation of benzoic acid through excised guinea pig dorsal skin: comparison of their enhancement effects with hemolytic effects on erythrocytes. Chem Pharm Bull 2001;49:1155-58. 21. Park ES, Chang SY, Hahn M, Chi SC. Enhancing effect of polyoxyethylene alkyl ethers on the skin permeation of ibuprofen. Int J Pharm. 2000;209:109-19. 22. Okuyama H Ikeda Y, Kasai S, Imamori K, Takayama K. Nagai T. Influence of non-ionic surfactants, pH and propylene glycol on percutaneous absorption of piroxicam from cataplasm. Int J Pharm. 1999;186:141-48. 23. Dalvi UG, Zatz J. Effects of nonionic surfactants on penetration of dissolved benzocaine through hairless mouse skin. J Soc Cosmet Chem1999;32:87-94. 24. Kushla GP, Zatz JL. Correlation of water and lidocaine flux enhancement by cationic surfactants in vitro. J Pharm Sci 1991;80:1079-83. 25. Lopez A, Llinares F, Cortell C, Herraez M. Comparative enhancer effects of Span® 20 with Tween® 20 and Azone® on the in vitro percutaneous penetration of compounds with different lipophilicities. Int J Pharm 2000;202:133-40. 26. Froebe CL, Simion FA, Rhein LD, Cagan RH, Kligman A. Stratum corneum lipid removal by surfactants: Relation to in vivo irritation. Dermatologica 1990;181:277-83. 27. Aulton ME. Pharmaceutics -The science of dosage form design, 2 nd ed. Philadelphia (US): Churchill Livingstone; 2002. 28. Swarbrick J. Encyclopedia of pharmaceutical technology. 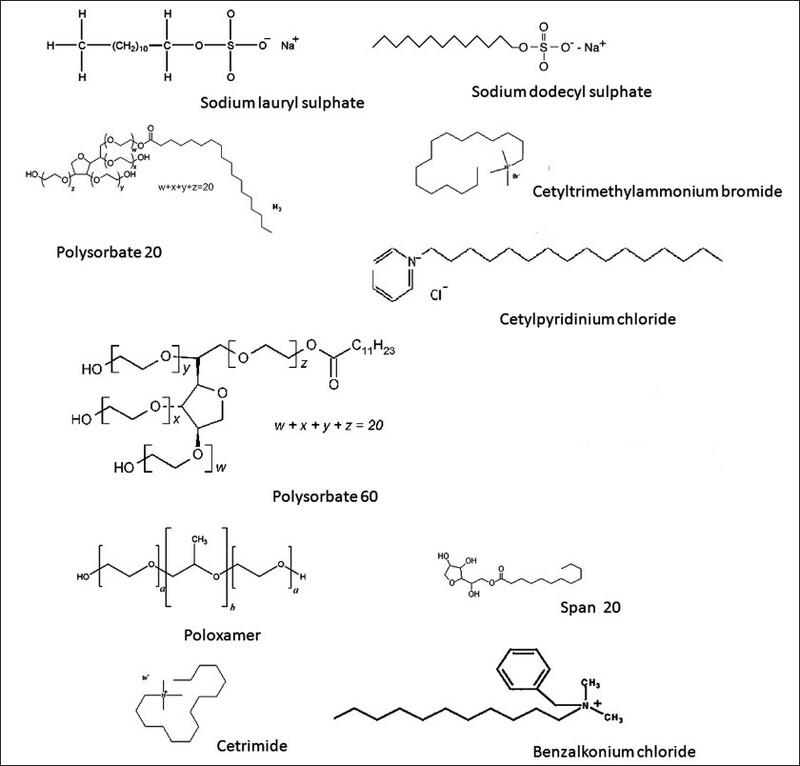 Surfactants in pharmaceutical products and systems. 3 rd ed. Vol 6. Informa Healthcare,CRC press hardcover; 2006. 29. Reiger MM, Rhein LD. Surfactant in Cosmetics, Vol 68 New York:Marcel Dekker;1997. 30. Lee CK, Uchida T, Kitagawa k, Yagi K, Kim NS, Goto S. Skin permeability of various drugs with different lipophilicity. J Pharm Sci 1994;83:562-65. 31. Scheuplein RJ, Ross L. Effects of surfactants and solvents on the permeability of epidermis. J Soc Cosmet Chem 1970;21:853-73. 32. Walker RB, Smith EW. The role of percutaneous penetration enhancer. Adv Drug Del Rev 1996;18:295-01. 33. Nokhodchi A, Shokri J, Dashbolaghi A, Hassan-zadeh D, Ghafourian T, Barzegar-jalali M. The enhancement effect of surfactants on the penetration of lorazepam through rat skin. Int J Pharm 2003;250:359-69. 34. Cappel MJ, Kreut J. Effect of nonionic surfactants on transdermal drug delivery: I. Polysorbates. Int J Pharm. 1991;69:143-53. 35. Shokri J, Nokhodchi A, Hassan-zadeh D, Ghafourian T, Barzegar-jalali M. The effect of surfactants on the skin penetration of diazepam. Int J Pharm 2001;228:099-107. 36. Shen WW, Danti AG, Bruscato FN. Effect of nonionic surfactants on percutaneous absorption of salicylic acid and sodium salicylate in the presence of dimethyl sulfoxide. J Pharm Sci 1976;65:1780-83. 37. Hwang CC. Percutaneous absorption of flufenamic acid in rabbits: effect of dimethyl sulfoxide and various nonionic surface-active agents. J Pharm Sci 1983;72:857-60. 38. Walters KA, Hadgraft. J. Pharmaceutical skin penetration enhancement, Vol 59 New York: Marcel Dekker; 1993. 39. Ridout G, Hostynek JJ, Reddy AK, Wiersema RJ, Hodson CD. Lorence CR, et al. The effects of zwitterionic surfactants on skin barrier function. Fundamental and applied toxicology 1991;16:41- 50. 40. Kitagawa S. Enhanced skin permeation of cationic drug ketotifen through excised guinea pig dorsal skin by surfactants with different electric charges. Chem Pharm Bull 2003;51:1183-85. 41. Keisuke Y, Yuri T, Hidero A, Kazuyuki T, Hiraku O, Yoshiharu, M. Effect of penetration enhancer on transdermal delivery of propofol, Biol Pharm Bull 2009;32:677-83. 42. Aungst BJ, Rogers NJ, Shefter E. Enhancement of naloxone penetration through human skin in vitro using fatty acids, fatty alcohols, surfactants, sulphoxides and amides. Int J Pharm 1986; 33:225-34. 43. Vaddi HK, Wang LZ, Ho PC, Chan SY. Effect of some enhancer on the permeation of haloperidol through rat skin in vitro. Int J Pharm 2001;212:247-55. 44. Zhao H, Choi MK, Kim JS, Yong CS, Choi HG, Chung SJ, et al. Synergistic enhancing effect of DEET and dodecylamine on the skin permeation of testosterone from a matrix type transdermal delivery system. Drug Deliv 2009;16:249-53. 45. Fang JY, Fang CL, Huang YB, Tsai YH, Transdermal iontophoresis of sodium nonivamide acetate.III combined effect of pretreatment by penetration enhancer. Int J Pharm 1997:149:183-93. 46. Ashton P, Walters KA, Brain, KR, Hadgraft J. Surfactant effects in percutaneous absorption effects on the transdermal flux of methyl nicotinate. Int J Pharm 1992; 87:261-64. 47. Endo M, Yamamoto T, ljuin T. Effect of nonionic surfactants on the percutaneous absorption Tenoxicam. Chem Pharm Bull 1996;44: 865-67. 48. Mukherjee B, Priya K, Mahapatra S, Das S, Sorbitan monolaurate 20 as a potential skin permeation enhancer in transdermal patches. J App Res 2005;5:96-98. 49. Shin SC, Cho CW, Oh I.J. Effects of non-ionic surfactants as permeation enhancers towards piroxicam from the poloxamer gel through rat skins. Int J Pharm 2001;222:199-203. 50. Shin SC, Lee HJ. Enhanced transdermal delivery of triprolidine from the ethylene-vinyl acetate matrix. Eur J Pharm Biopharm 2002; 54:325-28. 51. Sarpotdar PP, Zatz JL, Evaluation of penetration enhancement of lidocaine by nonionic surfactants through hairless mouse skin in vitro. J Pharm Sci 1986;75:176-81. 52. Limpongsa E, Umprayn K. Preparation and evaluation of diltiazem hydrochloride diffusion controlled transdermal drug delivery. AAPS Pharm Sci Tech 2008; 9:464-70. 53. Kumar D, Aqil M, Rizwan M, Sultana Y, Ali M. Investigation of a nanoemulsion as vehicle for transdermal delivery of Amlodipine. Pharmazie 2009; 64:80-85. 54. Park ES, Chang SY, Hahn M, Chi SC. Enhancing effect of polyoxyethylene alkyl ethers on the skin permeation of ibuprofen. Int J Pharm 2000; 209:109-19. 55. Sarpotdar PP, Zatz JL. Percutaneous Absorption Enhancement by Nonionic Surfactants. Drug Dev Ind Pharm 1987;13:15-37. 56. Arellano A, Santoyo S, Martn C, Ygartua P. Surfactant effects on the in vitro percutaneous absorption of diclofenac sodium. Eur J Drug Metab Pharmacokinet 1998;23:307-12. 57. Bhaskaran S, Harsha SN. Effect of permeation enhancer and iontophoresis on permeation of atenolol from transdermal gels. Ind J Pharm Sci 2000;62:424-26. 58. Shen WW, Danti AG, Bruscato FN. Effect of nonionic surfactants on percutaneous absorption of salicylic acid and sodium salicylate in the presence of dimethyl sulfoxide. J Pharm Sci 976;65:1780-83. 59. U.S. Food and Drug Administration, Title 21, Code of Federal Regulations, Part 182, 184, 186. Office of the Federal Register, National Archives and Records Administration 2007. Waters, L.J. and Dennis, L. and Bibi, A. and Mitchell, J.C.
Aggarwal, N. and Goindi, S. and Khurana, R.
Liu, K.-C. and Green, C.R. and Alany, R.G. and Rupenthal, I.D. Roure, R. and Lanctin, M. and Nollent, V. and Bertin, C.